I have had the good fortune to collaborate on research with many talented students during my years at Pomona College, and it has been wonderful sharing some of their accomplishments over the years as they forge ahead into careers and/or graduate school. 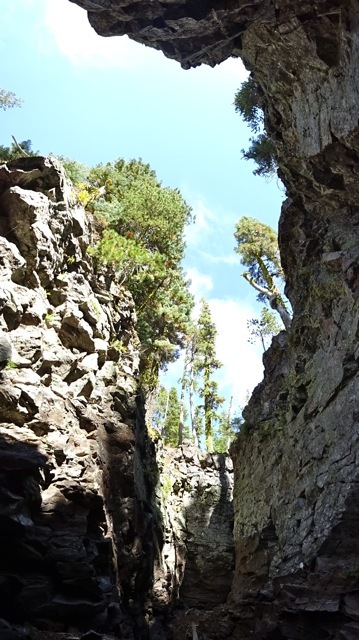 Several summers ago I worked jointly with rising senior Robby Goldman (’15) and rising junior Jack Albright (’16) on a project transitioning my exploration of caldera formation from 2D axisymmetric finite element models to a 3D configuration that permitted inclusion of tectonic stress effects, and their paths and interests have been intertwined ever since. Both went on to do modeling-focused senior thesis projects exploring volcanological topics, and via different routes both made their way to UIUC where they are now working with my collaborator Dr. Patricia Gregg. Along the way Robby and Jack acquired many well-deserved accolades–among them a Fulbright, 2 NSF Graduate Fellowships (Albright ; Goldman), and a prestigious UIUC scholarship. I’m just as impressed, however, by their dedication to communicating their science to a variety of different audiences, for instance on the UIUC campus via open house demonstrations, via prolific YouTube postings during a science cruise to study seafloor volcanism in the Pacific, and most recently at the national level via the new AGU Voices for Science program. I can’t wait to see what these gifted young scientists do next, but I bet it will be as spectacular as the volcanism they’re studying while at UIUC! My research is predominantly organized around numerical modeling of subsurface volcanic processes. I would never claim to be a field geologist, but even so my insight into volcanic processes is enhanced every time I have a chance to observe volcanic phenomena and products directly. Happily, this past year I have enjoyed ample opportunities to visit several different volcanoes–on my own, with colleagues, and with students. Morro Rock, CA (Mar., 2017): During a trip up the California coast I visited Morro Rock. The iconic 575′ volcanic plug is the westernmost of an aligned series of intrusives that formed ~22 million years ago. Originally located deep underground, this dacitic plug is probably the remains of a volcanic conduit system. 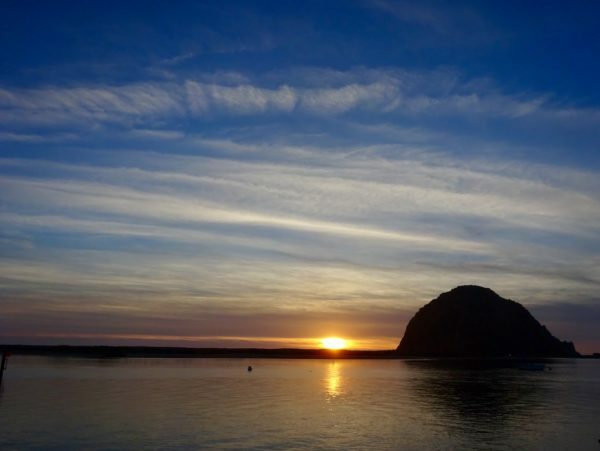 Today it anchors the Morro Bay harbor, and is a stunning landmark along this stretch of the California coast. Kilauea/Mauna Loa/Hualalei, HI (May, 2017): Before and after the Cordilleran GSA meeting in Honolulu I had a chance to spend a number of days on the Big Island of Hawaii. Several of these days were spent on a GSA field trip run by Dr. Tina Neal and Dr. Don Swanson, current and former Scientists in Charge at the Hawaii Volcano Observatory. On this engaging and informative trip we were introduced to a number of stunning volcanic landscapes and processes–one of my favorites was a superelevated lava flow emplaced in 1974–but our primary focus was to examine several summit deposits and processes on Kilauea, including those associated with the infamous 1790 explosive sequence. After GSA, where I presented an analysis of caldera formation on Mars, I returned to the Big Island for some less formal exploration, generously guided by my friend and Emeritus Professor of Geology (retired) Rick Hazlett, who now lives in Hilo. One of my dreams for the Volcanology course I teach at Pomona is to secure enough funding to support an every-other-year trip to Hawaii for the enrolled students; this would enable them to apply their quantitative skills to field-based problems in this volcanic wonderland, and would also enrich the course with several key qualitative analyses. With that goal in mind, Rick and I explored an array of sites on Kilauea, Mauna Loa and Hualalei to assess their suitability. 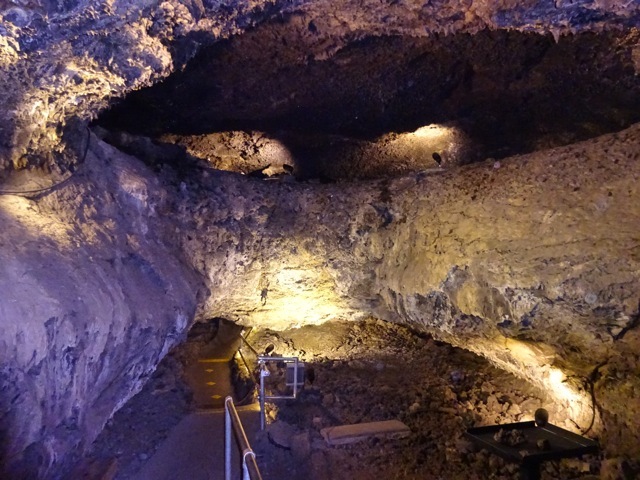 We walked through lava tubes, looked at channelized flow processes and tree molds, enjoyed coastal exposures, did a detailed walk-through of Kilauea Iki, and visited a large number of lava-structure interactions to gain insight into this pervasive element of the Hawaiian experience. Mt. 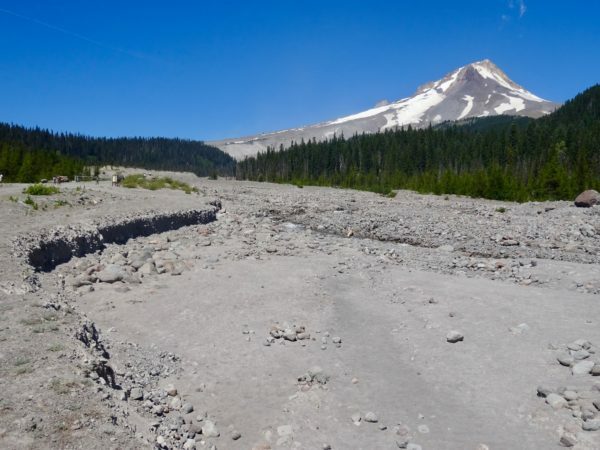 Hood, OR (Aug., 2017): Toward the end of the summer I attended the IAVCEI Scientific Conference in Portland, where I presented a “where are we now” talk sharing new insights into the mechanics of radial dike formation at several different scales. One day of the conference was dedicated to field trips, and I had the good fortune to see a volcano I’d never visited: the iconic Mt. Hood. 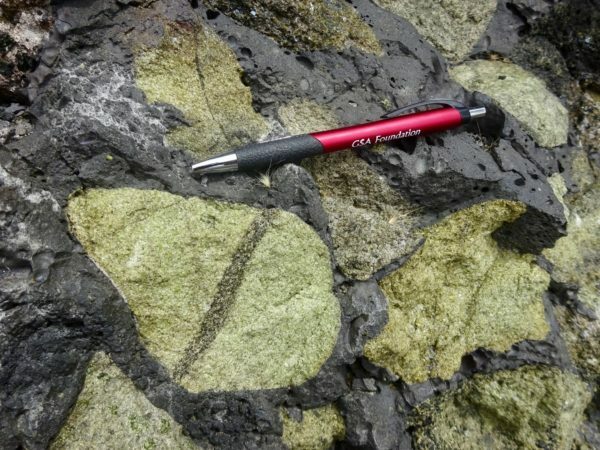 The lovely composite cone geometry is a product of lava effusions and repeated lava dome collapses that fed pyroclastic flows, and it has experienced vigorous lahar activity as well. Mt. St. Helens, WA (Aug., 2017): After the IAVCEI conference my family flew up to Oregon to watch the solar eclipse (the zone of totality passed just south of Portland; it was incredible! ), and we took the opportunity to visit Mt. St. Helens. This trip was a “tourist” visit, not a professional one per se, but I took a lot of photos to use in my volcanology course and really enjoyed the chance to see the products of the volcanic avalanche (I visited the much larger deposits around Mt. 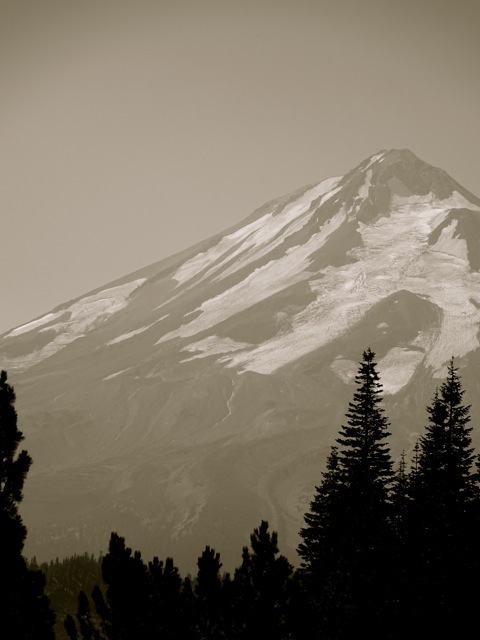 Shasta in California a few years back), the current dome growing in the crater, and the trees that had been knocked flat by the blast. 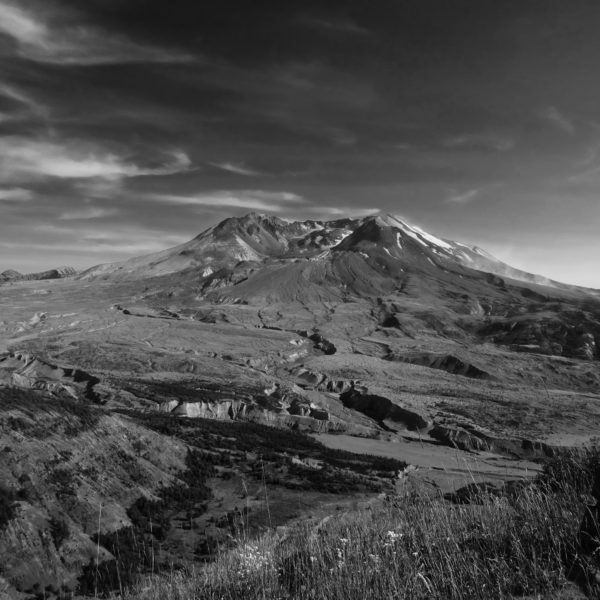 Roughly a third of a century later the region has recovered to some extent, but the signature of the May 1981 eruption still dominates the landscape quite clearly. Amboy Crater, CA (Feb., 2018): After studying lava flows for a bit, my volcanology class took a trip out to see the Amboy Crater scoria cone in the Mojave Desert. I have been visiting this site for many years, but see something new every time I’m there. This year, in addition to studying the sequence of events that formed the cone and surrounding lava flows, we took some first-order measurements of tumuli to try and assess the magma pressure responsible for their inflation. It’s nice having such a pristine volcano only a few hours away from campus! 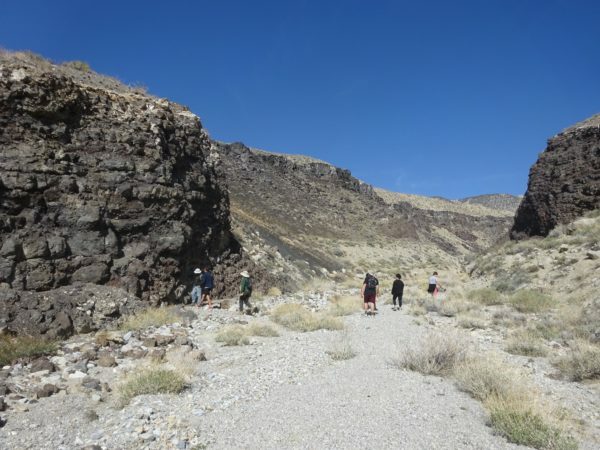 BPVF/Long Valley/Panum Crater, CA (Apr., 2018): Toward the end of the spring semester the volcanology and petrology classes took a joint, multi-day field trip to see parts of Owen’s Valley, Long Valley and the Mono Basin, which together exhibit a breathtaking array of volcanic styles. Owens Valley, Long Valley and Mono Basin field area. 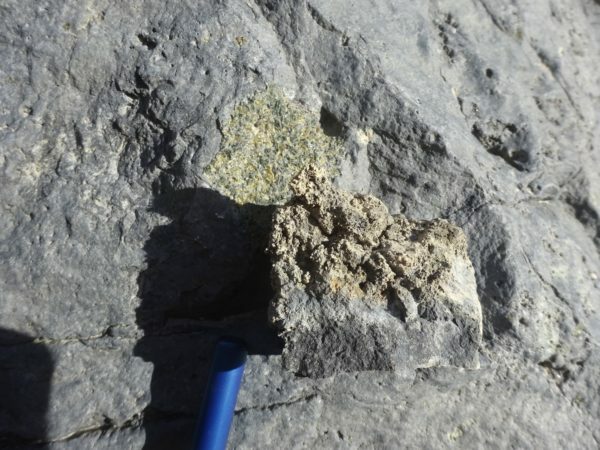 Several of our stops occurred in the Big Pine Volcanic Field (BPVF), where we examined S-type granites and Independence dikes at Kern Knob, the faulted Fish Springs cone, and the incredible Papoose Canyon cone which has been neatly bisected by a fluvial channel, thereby providing hands-on access to the majority of the xenolith-rich flow sequence that built the cone. Papoose Canyon xenolith and contact. 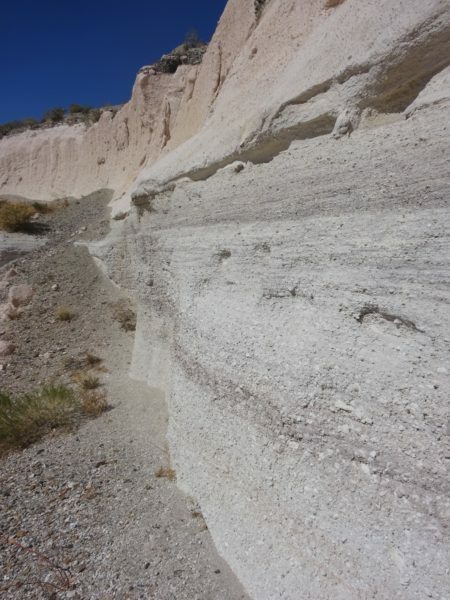 At Long Valley we spent considerable time studying deposits emplaced during the cataclysmic caldera-forming Bishop Tuff eruption that occurred 767 thousand years ago. This ‘supereruption’ emplaced ~600 km^3 of felsic material over a few short days as the ring faults ‘unzipped.’ Much of our time was spent examining the airfall and ignimbrite exposures at the classic Chalfant quarry site, but we also visited several other locales to examine variations in the degree of ignimbrite welding and to view the southern part of the caldera and resurgent dome from afar! Finally, not content with basaltic cones and massive ignimbrite eruption deposits, we visited Panum Crater, the northernmost member of the Mono Domes and, having formed only 600 yrs ago, the youngest. 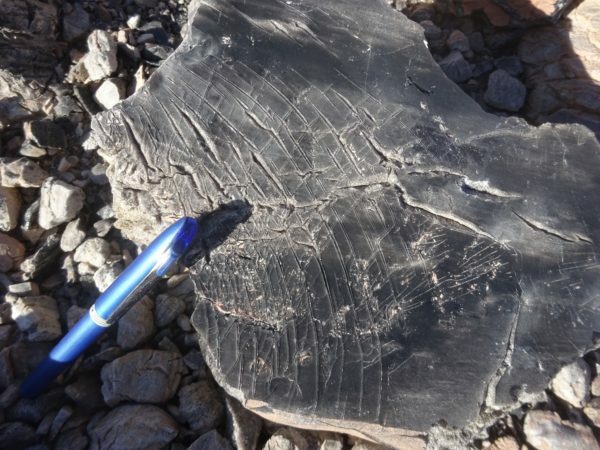 Although it has enjoyed a complex history, Panum today is defined by a cavity formed during an early phreatomagmatic explosion, a low tuff ring formed during an intermediate Strombolian eruption, and a terminal, conduit-plugging silicic dome that exhibits obsidian banding, bread crust textures, and debris from collapsed spines. 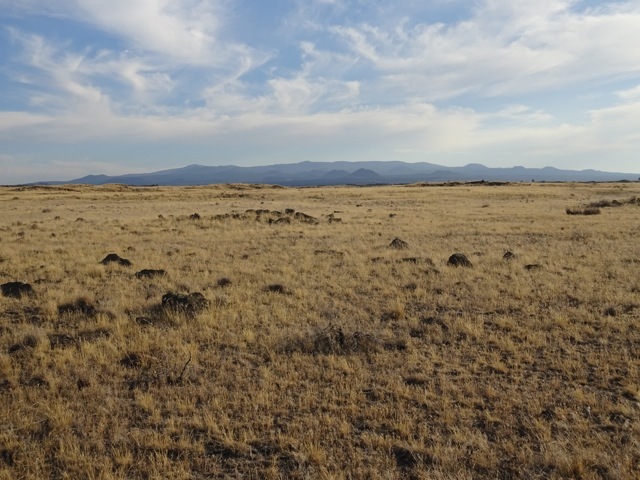 Yielding stunning views across the Sierran front and the Mono Basin (including the Paoha, Negit and Black Point constructs — parts of the volcanic story that will have to wait for a different trip! ), Panum was a great way to end the middle day of our field trip! Exploring exciting new research questions with my students and colleagues is one of the most fun parts of my job, but many of these pursuits require funding–and chasing that down isn’t quite as much fun. Grant proposals take a long time and a lot of effort to prepare, and the odds of landing a grant are low, roughly on par with what it takes to be admitted as a student at Pomona College right now. So, when a grant is ‘landed’ it is a cause for celebration! I’m therefore pleased to report that a proposal I submitted recently to NASA’s Solar System Workings program with my Lunar and Planetary Institute colleague Dr. Pat McGovern (PI), was among those selected for funding. 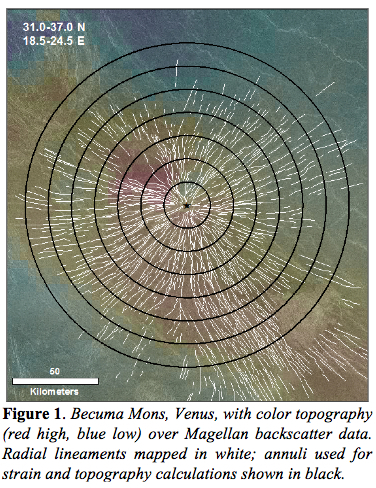 Entitled “Breaking the barriers: Time-dependent, stress-controlled growth of large volcanoes on Venus and implications for the mechanics of magma ascent, storage, and emplacement,” the funds from this grant will allow several students to contribute to GIS- and/or numerical modeling-grounded research during the summers of 2018-2020. I’m excited to get underway with the first students in a few short weeks! For more detail, a Pomona College press release about the grant can be found here. — Thinking About A Geoscience Career? 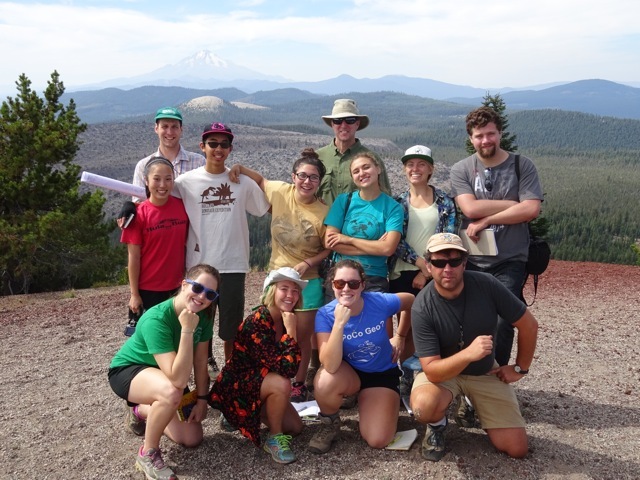 As students look at colleges, or when they first decide to take an introductory geology course, one of the questions my colleagues and I are often asked is what happens after college if they major in geology. What do students do after graduation? Is their experience likely to be rewarding and enriching? How easily do they get into graduate school? Will what they learn help prepare them to succeed at their first job? What are their employment prospects, and what kind of life can they expect? These are great questions and, although everyone’s circumstances will be unique, we have lots of answers. Their love of science — field work, laboratory analysis, numerical modeling, etc. — in combination with the strong connection between geoscience knowledge and the challenges our world faces, is what lures many students into a geology major here at Pomona. As a result, not surprisingly, our graduates go all kinds of directions as they strive to apply or build upon what they have learned. They go into business, education, medicine, and law; into geotechnical and environmental firms; they work for all levels of government and in their communities; and, of course, most who wish to do so transition very successfully to strong graduate programs. Students can certainly pursue avenues with high salary potential, and/or opt for lots of time outdoors, and/or they can walk paths with other benefits for themselves and those around them… opportunities abound. It is exciting is to see how each graduate brings their own strengths and interests together, how they choose to move forward — and no matter where they go our students continually amaze us and make us proud. 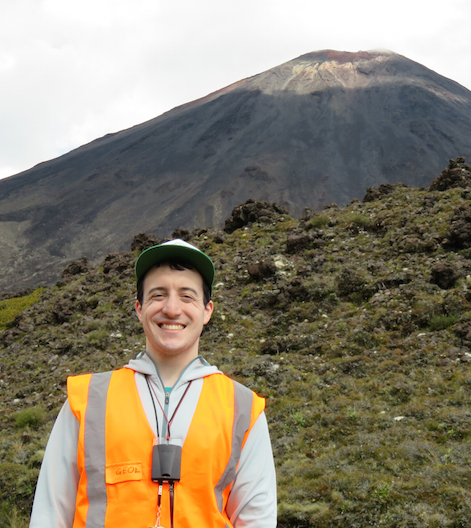 Robby Goldman (PO ’15), who spent his summer and senior year using finite element models to explore caldera formation, was recently chosen to receive a Fulbright Award that enables him to spend 2016 in New Zealand continuing his research under the guidance of Darren Gravley (’96). In 2017 Robby will expand his skills as a graduate student working with Trish Gregg at the University of Illinois Urbana-Champaign. My heartiest congratulations Robby! Bringing together several years of research with students and colleagues, I recently published two papers in the book “Volcanism and Tectonism Across the Solar System,” Geological Society of London Special Publication 401, which is due for release in 2015. 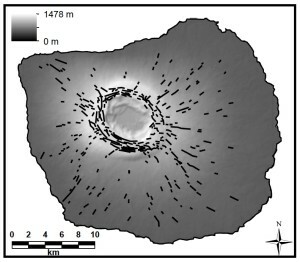 The first paper, entitled Elastic models of magma reservoir mechanics: a key tool for investigating planetary volcanism, uses elastic finite element models to demonstrate how the interplay between volcanic elements – such as magma reservoir geometry, host rock environment (with an emphasis on understanding how host rock pore pressure assumptions affect model predictions), mechanical layering, and edifice loading with and without flexure – dictates the overpressure required for rupture, the location and orientation of initial fracturing and intrusion, and the associated surface uplift. The second paper, entitled Lithospheric flexure and volcano basal boundary conditions: keys to the structural evolution of large volcanic edifices on the terrestrial planets, examines how flexure of the mechanically strong outer layer of a planet influences magma ascent paths and chamber dynamics in the lithosphere, often favoring the development of oblate magma chambers or sill complexes. — the dedicated Pomona Geology crew enjoying the moment! — view from within a dike-induced ground crack… my own little slice of heaven! This past March, two current students and one recent graduates culminated their research with Prof. Grosfils by giving a presentation at the 2014 Lunar and Planetary Science Conference in Houston, TX. Weighing in at his first conference, Jack Albright (’16) represented the rest of the student and faculty team (John Baxter ’09, Peter Ferrin ’14, Dr. Grosfils, Dr. McGovern) as he explained the team’s new insights into “Using Mapping-derived Quantitative Strain Estimates to Test Uplift versus Dike Emplacement Models for Giant Radial Lineament System Formation on Venus” to a diverse array of planetary scientists. Continuing our tradition of celebrating student achievement and performance at the conference, the presenters joined other Sagehen alumni attending the conference for some conversation and reminiscing over refreshments: as always, it is terrific to see current and former students mixing it up and sharing stories about their Sagehen days! I am pleased to report that Shelley Chestler (’12) and I have just published her senior thesis research in the journal Geophysical Research Letters. 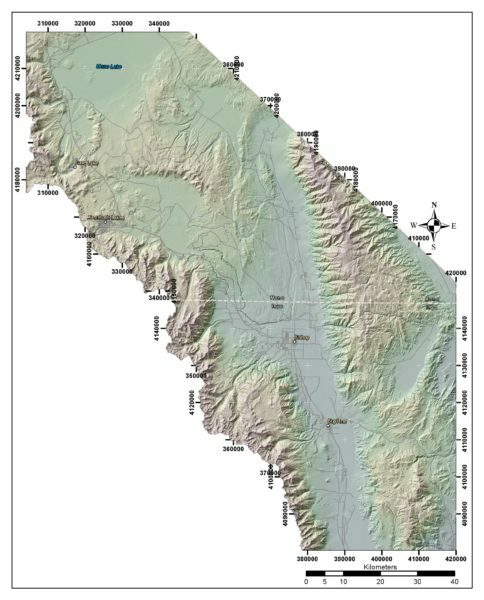 Using numerical finite element models, and targeting Fernandina volcano (shown at right) as a case study, the article demonstrates how minor, volcanologically plausible variations in a magma reservoir system can lead to the intrusion of radial, circumferential, and corkscrew-style dikes akin to those that characterize many volcanoes in the Galapagos and elsewhere. This result is an exciting one, offering a solution to a problem that has puzzled geologists for some time, and complementing other recent edifice-modeling efforts (e.g. Hurwitz et al. 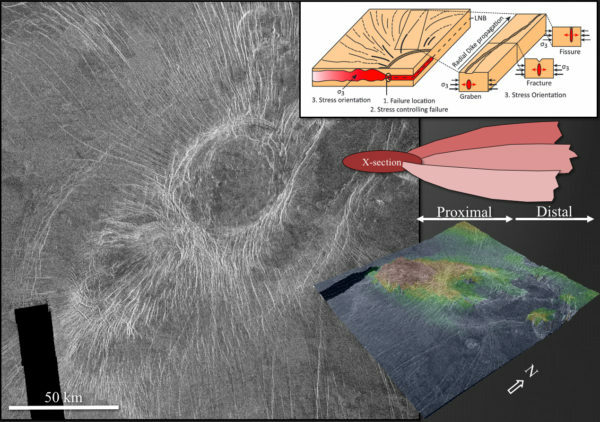 2009; Galgana et al., 2012) we have now identified conditions that can lead directly to lateral intrusion of radial dikes from a shallow magma reservoir. For more information: Chestler*, S.R., and E.B. Grosfils, Using numerical modeling to explore the origin of intrusion patterns on Fernandina volcano, Galapagos Islands, Ecuador, Geophysical Research Letters, 40, 4565-4569, doi:10.1002/grl.50833, 2013. — Why Do Teachers Perform Research? There are clearly connections to teaching when I involve and mentor students, but it is important to recognize as well that my teaching and capabilities as an instructor usually benefit even when no students are directly involved in the research I perform. As a liberal arts instructor then my answer to the question I’m often asked is simple: I believe that doing research makes me a better teacher. In my view, striving to become a more effective teacher is a goal which more than justifies the time and energy required to perform scholarly research, and I am grateful for the opportunities I have had in this arena. Of course, the fact that I also derive deep satisfaction from gaining new insights with the potential to help people directly, or that simply increase our knowledge in a more abstract way about the fascinating solar system in which we reside, is simply icing on the proverbial cake!